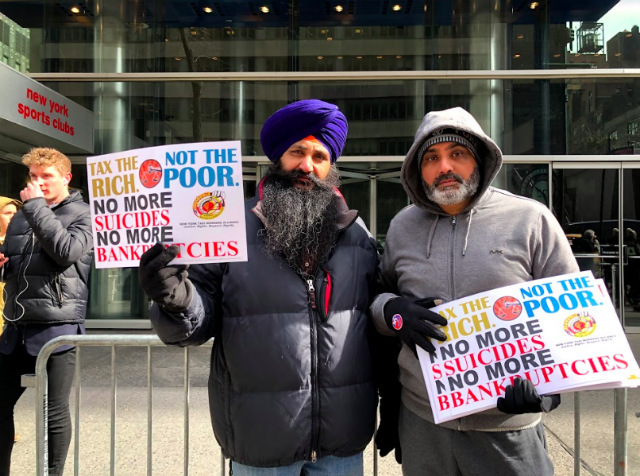 Yellow cab drivers have a seen a loss of 15 to 20 percent in revenue since the state’s congestion pricing surcharge went into effect last month, according to The Taxi Worker’s Alliance, which arrived at the estimate after reviewing trip records from drivers. The congestion pricing fees are expected to generate $400 million a year for the MTA, but several taxi drivers interviewed on Wednesday said the fundraising initiative is cutting deeply into their already slim margins. Under the congestion pricing fees that went into effect in February, yellow cab passengers pay a $2.50 surcharge for rides below 96th Street in Manhattan. Other for hire vehicle riders pay $2.75. Uber said at the time that it would raise prices to cover the cost. Taxi Worker’s Alliance executive director Bhairavi Desai is calling on state lawmakers to make an exemption for yellow and green cabs because they’ve been paying a 50 cent surcharge to the MTA since 2009. Desai argues that taxi drivers face fees and fines unlike another business in the state. For example, if a driver does a small trip that costs $10, the taxes on that ride would be nearly 30 percent. Drivers are required to pay state taxes at the end of every month, and face a 200 percent fee if they’re late. Yellow Cab Drivers Protest New Congestion Pricing Surcharge: Gothamist.